Timing is everything, especially when it comes to a rally. One of the largest protests of the suffrage movement happened the day before Woodrow Wilson was to be inaugurated as President in 1913. Between 5,000 to 8,000 suffragists marched down Pennsylvania Avenue, past the White House  and hundreds of thousands of onlookers. 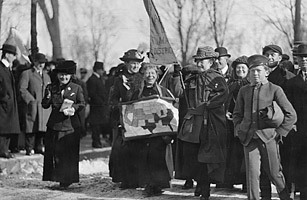 Organizers Alice Paul and Lucy Burns had secured a permit to march, however, many protesters were assaulted by those in the crowd who opposed the women's right-to-vote campaign. Attacks ranged from spitting and throwing of objects to all-out physical assaults. While many women were injured, public outrage at the violence translated to wider support for the suffrage movement.